This is another entry in our WP Heavy Hitters series that showcases the talent in the vibrant WordPress community. Who said programming is just for guys? Andrea is an expert in WordPress and specifically the multi user variety with skills that put most guys to shame. I’ve been a blogger for years, back when it was online journaling, and I came to WordPress with the licensing change on Movabletype 2.6, so WordPress was around version 1.5 then. I just got really interested in the template system, as it has just switched from being stylesheets only. I started figuring it out, because it was really interesting, and seeing what other moms were doing with their blogs just inspired me to try it for myself. I found I really liked figuring out what made it work, and how to change certain things, and other moms in the online world would eventually ask for my help. Then I figured out I could get paid. Could you tell us more about your tutorials and eBooks? The impetus for it was the realization that we had too many clients, and many of the people we were turning down wanted similar sites to ones we had developed before, or the same sort of plugin. Especially those kinds of plugins that needed extra documentation and support to get running. They are also more fun to do – Ron gets to code up something awesome, and I get to write about it. We also found in doing client work, a number of our developer friends were willing to pay for help for these kinds of plugins, so putting them out there in the market seemed natural. This way more end-users get helped. What are some of the plugins you offer? What do these plugins do? Professional Domain Mapping – this plugin is a more streamlined version than the WPMU Domain Mapping that is available. It gives one menu for the Super Admin to map a top-level domain to any blog in the network, and also hides the originating domain. It’s been incredibly useful for devs who manage one network with a site for each client. Or, if you want to manage multiple domains from one install, and have very few users. Networks Plus – is similar to domain mapping in that you can use different top-level domains with any other site. the added difference is this allows you to create another network in the install. Each new domain you add will have the ability to have child blogs. The WP Replicator plugin is for admins running a network who wish to set up a template blog with all the default they wish – widgets, plugin settings, theme settings, and copy that at any time, or have it be applied to any new blog created in the network, with one click. This is our best seller. I’m working on some more ebooks for setting up specific kinds of sites, geared towards developers or people who just want to use WordPress to make that kind of site for themselves. Like we did a business directory kind of site for a client, had it in our portfolio and then had a lot of requests about it. Putting that in ebook format with the plugins needed seems like a win-win. I’m also co-authoring a book with some really cool people: Lisa Sabin-Wilson, Cory Miller, Michael Torbert and Kevin Palmer. It’s called the WordPress All-In-One Desk reference and should be out in spring of next year. I’ll be doing the section on multisite, of course. We’ve also got some exciting changes coming up for PremiumBPThemes.com, but I’m not quite ready to spill on that yet. Would you mind listing some of the ebooks you offer? It goes over step by step how to enable the network (multisite) in WordPress, complete with screenshots and any tricky situations you might encounter during setup. What do you attribute to your products/services success? I really could not have done all this without Ron. We’d met in college when we both took a computer programming course. I figured out it wasn’t for me, we got married and he started his career. So while I was home poking and prodding WordPress, I was able to ask him some of the more difficult coding questions. Eventually, I was asking more difficult questions and he had to sit down and start working with it himself. He’d worked as a freelancer before, and when what I was doing started to really take off, we decided we’d both jump in. I also think that because Ron & I are a two-person shop, we can quickly adjust any business ideas we have and make small changes that can really help us in the long run. Another thing is all the people that have helped us along the way – the WordPress community really does give a hand up. 😀 Most days, it’s really awesome. I can often say half a sentence and he knows exactly what I’m referring to. And being a freelancer working from home is usually solitary, so it’s nice to have someone right there who understands the work you do. Since he’d worked from home before, we as a family were used to having him around too, and we liked that. On the other hand, it took some adjustments in working together. It’s different relating to your spouse in a work environment, and we’d taken more traditional roles in our marriage. In our work life, there was a space where we each had to adjust the way we thought of the other, and how we could talk about work-related issues without it becoming something we had to avoid at the dinner table. I mean, it’s one thing if your spouse doesn’t fold the laundry the same way you do. Most people can move on. When you work with your spouse, and they troubleshoot css issues using a different approach than you… sometimes you just have to turn your chair around and not watch them. It was also a bit of an ego check to have introduced Ron to WordPress, then watch him exceed me greatly in his knowledge of the code itself. But, we’ve also grown in our workflow, so we stick with what we both work best at, which happily compliments each other. How do you see Multi-Site evolving? More streamlined. 🙂 I can see things that are global becoming more efficient with a few new functions for people to hook into, to further plugin development specifically geared towards global content; both the management and display of. I can see users becoming easier to manage across the network as well. I can’t see it becoming easier to set up though. To me, it’s still an intermediate level (not for beginners) server-based feature and will probably remain so for a long time. One thing that fizzled was a plugin we had sold to remove the /blog/ permalink in subfolder setups. A couple other plugins to do the exact same thing were all released around the same time. But this goes back to what I was saying earlier about being able to make adjustments quickly. We just pulled it down and moved on to the next thing on our list. Something that took off in a huge way was the free ebook I wrote on how to set up WordPress MU 2.7. I honestly never expected it to be such a big hit, it was just something I wrote up to make it easier for the people I was helping in the forums who needed extensive guidance. Last time I checked, it had been downloaded over 18 *thousand* times. I’m still amazed. Up up and waaaaay up. 🙂 Five years ago, it was a baby. Five years from now, we won’t be asking people what powers their blog, it’ll be WordPress. Andrea shows her admiration for her family and WordPress with her ending remark. Related to that, the second generation of WordPress developers are coming. One of our children is studying to be a graphic designer with plans to go into WordPress freelancing. 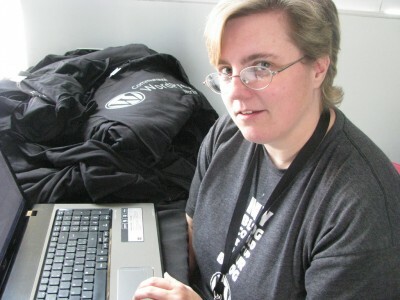 Sarah’s definitely someone to watch – we took her to WordCamp Montreal with us and we had a blast. Thanks Andrea for the interview. Keep us posted on your future adventures. Looking forward to checking that *big* book! Andrea is definitely the queen of WordPress. I often find myself searching through forums & including “andrea_r” in my query. This helps to narrow down the results to what will be most helpful.